[Figure 1] shall explain the anatomico-physiological basis of the alpha-gamma collaboration in the mediation of the stretch reflex. The stretch reflex has been for ages, thought to be a spinal reflex of short latency. In 1924, Liddell and Sherrington demonstrated the tonic response to stretch in the decerebrate cats and named it the “tonic reflex.” In addition, Sherrington wrote that “there could be little doubt that the knee jerk, a reaction, long familiar to the physician, is a fractional manifestation of it… The physician in testing the knee jerk is in fact, testing the stretch reflex of an anti-gravity muscle,”, and Denny-Brown and Liddell adduced enough evidence to suggest that the stretch reflex is a spinal process following their experiments on “spinal” dogs. An extensive account of the spinal cord and the mediation of reflex through it can be obtained from the masterly treatise, Reflex Activity of the Spinal Cord, compiled by Creed et al. in 1938. In 1953, Merton, the physiologist from Cambridge, proposed a servo control model for the generation of movement which was based on the stretch reflex. He felt that the muscle spindles and the γ-motor neuron system were an integral part of the servo mechanism controlling the length of the muscle and suggested that the reflex helped control posture by increasing the activation of the muscle in direct proportion to the degree of its stretch., Merton proposed that the whole system worked like the servo system on a car steering. If the brain wished to contract a muscle to a certain length, it commanded the small sense organs in the muscles to react as if they had been already stretched to the intended position. The result would be reflex contraction of the muscle in question, and this meant that the nervous system only needed to specify the end position of any movement. This was the first attempt to explain how the nervous system might achieve accurate control of movements. Merton's initial experiments were designed to investigate how the sensory information from muscle spindles was used in normal voluntary movement as opposed to the rather unnatural example of the tendon jerk. The issue whether stretch reflexes were abolished in lesions of the dorsal column, the afferent pathway for the reflex, was resolved when in one subject with a demyelinating plaque at the level of the C2 spinal segment, well above the segment subserving the reflex for the flexor pollicis longus, the stretch reflex was absent though all the upper limb jerks were within normal limits. The contralateral upper limb was normal in every aspect. Thus, Marsden et al. had the suspicion that the tendon reflex and the stretch reflex travelled through different pathways. Their works paved the way for the understanding of conditions such as stimulus-sensitive myoclonus and the absence of the long-latency loop in some cortical lesions. John Rothwell, a long-time associate of Marsden and currently, Professor of Human Physiology, Institute of Neurology, Queen Square, London, feels that many pathways link the afferent input from muscle spindles with motor neurons, and many of these pathways are within the local spinal segments, with the monosynaptic one being the simplest. Of course, there are multiple other possible connections through interneurons. What was special about the suggestion of the 3Ms was the pathways linking muscle spindle and the motor neuron that traversed the cortex also could participate in the stretch reflex. The 3Ms put spinal and cortical circuits in the same continuum and put forward the concept that the cerebral cortex also participates in the genesis of the stretch reflex (personal communication). This significant addition to the classical Sherringtonian concept that stretch reflexes were purely spinal in nature is a benchmark in the subsequent study of cortical functions and human neurophysiology. 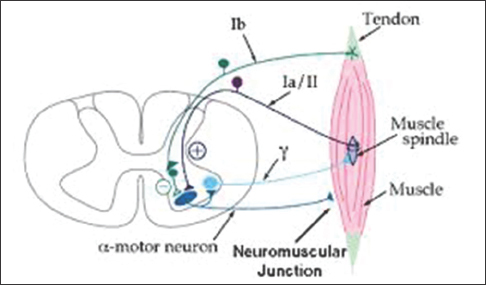 Eccles RM, Lundberg A. Supraspinal control of interneurones mediating spinal reflexes. J Physiol 1959;147:565-84. Eccles RM, Lundberg A. Integrative pattern of Ia synaptic actions on motoneurones of hip and knee muscles. J Physiol 1958;144:271-98. Laporte Y, Lloyd DP. Nature and significance of the reflex connections established by large afferent fibers of muscular origin. Am J Physiol 1952;169:609-21. Granit R, Strom G. Autogenetic modulation of excitability of single ventral horn cells. J Neurophysiol 1951;14:113-32. Eccles JC, Eccles RM, Lundberg A. The convergence of monosynaptic excitatory afferents on to many different species of alpha motoneurones. J Physiol 1957;137:22-50. Schieppati M, Nardone A. Medium-latency stretch reflexes of foot and leg muscles analysed by cooling the lower limb in standing humans. J Physiol 1997;503(Pt 3):691-8. Liddell EG, Sherrington CS. Reflexes in response to stretch (Myotatic reflexes). Proc Roy Soc 1924;96:212-42. Sherrington CS. Problem of muscle receptivity. Nature 1924;113:929-32. Denny-Brown DE, Liddell EG. The stretch reflex as a spinal process. J Physiol 1927;63:144-50. Creed RS, Denny-Brown D, Eccles JC, Liddell EG, Sherrington CS. Reflex Activity of the Spinal Cord. Massachusetts, USA: Oxford University Press; 1938. Merton PA. Speculations on the servo control of movements. In: Malcolm JL, Gray JA, Wolstenhome GE, editors. The Spinal Cord. Boston: Little Brown; 1953. Bhattacharyya KB. Eminent Neuroscientists: Their Lives and Works. 1st ed. Kolkata, India: Academic Publishers; 2011. Marsden CD, Merton PA, Morton HB. Is the human stretch reflex cortical rather than spinal? Lancet 1973;1:759-61. Mathews PB. Mammalian Muscle Receptors and Their Central Actions. London: Arnold; 1972. Granit R. The Basis of Motor Control. London: Academic Press; 1970. Marsden CD, Merton PA, Morton HB. Servo action in human voluntary movement. Nature 1972;238:140-3. Marsden CD, Merton PA, Morton HB. Stretch reflex and servo action in a variety of human muscles. J Physiol 1976;259:531-60. Hammond PH. Involuntary activity in biceps following the sudden application of velocity to the abducted forearm. J Physiol 1955;127:23-5P. Hammond PH. An Experimental Study of Servo Action in Human Muscular Control. Third International Conference on Medical Electronics. London; 1961. p. 190. Deuschl G, Lücking CH. Physiology and clinical applications of hand muscle reflexes. Electroencephalogr Clin Neurophysiol Suppl 1990;41:84-101. Deuschl G, Lücking CH, Schenck E. Hand muscle reflexes following electrical stimulation in choreatic movement disorders. J Neurol Neurosurg Psychiatry 1989;52:755-62. Deuschl G, Schenck E, Lücking CH. Long-latency responses in human thenar muscles mediated by fast conducting muscle and cutaneous afferents. Neurosci Lett 1985;55:361-6. Noth J, Podoll K, Friedemann HH. Long-loop reflexes in small hand muscles studied in normal subjects and in patients with Huntington's disease. Brain 1985;108(Pt 1):65-80. Phillips CG. The Ferrier lecture, 1968. Motor apparatus of the baboon's hand. Proc R Soc Lond B Biol Sci 1969;173:141-74. Phillips CG, Powell TP, Wiesendanger M. Projection from low-threshold muscle afferents of hand and forearm to area 3a of baboon's cortex. J Physiol 1971;217:419-46. Palmer E, Ashby P. Evidence that a long latency stretch reflex in humans is transcortical. J Physiol 1992;449:429-40. Matthews PB. The human stretch reflex and the motor cortex. Trends Neurosci 1991;14:87-91. Capaday C, Forget R, Fraser R, Lamarre Y. Evidence for a contribution of the motor cortex to the long-latency stretch reflex of the human thumb. J Physiol 1991;440:243-55. Tatton WG, Lee RG. The effect of post-central cortical lesions on motor responses to sudden upper limb displacements in monkey. Brain Res 1975;96:108-13. Lee RG, Tatton WG. Motor responses to sudden limb displacements in primates with specific CNS lesions and in human patients with motor system disorders. Can J Neurol Sci 1975;2:285-93. Carmichael EA. Myoclonus. Proc R Soc Med 1947;40:553. Sutton GG, Mayer RF. Focal reflex myoclonus. J Neurol Neurosurg Psychiatry 1974;37:207-17. Rosen I, Fehling C, Sedgwick M. Focal reflex epilepsy with myoclonus: Electrophysiological investigations and therapeutic directions. Electroencephalogr Clin Neurophysiol 1977;42:95-106. Shibasaki H, Kuroiwa Y. Electroencephalographic correlates of myoclonus. Electroencephalogr Clin Neurophysiol 1975;39:455-63. Marsden CD, Fahn S, editors. The Nosology and Pathophysiology of Myoclonus. Movement Disorders. Vol. 1. Butterworth Heinemann; 1995. p. 196-248. Halliday AM. The electrophysiological study of myoclonus in man. Brain 1967;90:241-84. Hallett M, Chadwick D, Marsden CD. Ballistic movement overflow myoclonus a form of essential myoclonus. Brain 1977;100:299-312. Kugelberg E, Widen L. Epilepsia partialis continua. Electroencephalogr Clin Neurophysiol 1954;6:503-6. Adrian ED, Moruzzi G. Impulses in the pyramidal tract. J Physiol 1939;97:153-99. Jenner JR, Stephens JA. Cutaneous reflex responses and their central nervous pathways studied in man. J Physiol. 1982;333:405-19. Matthews PB. Evidence from the use of vibration that the human long-latency stretch reflex depends upon spindle secondary afferents. J Physiol 1984;348:383-415.